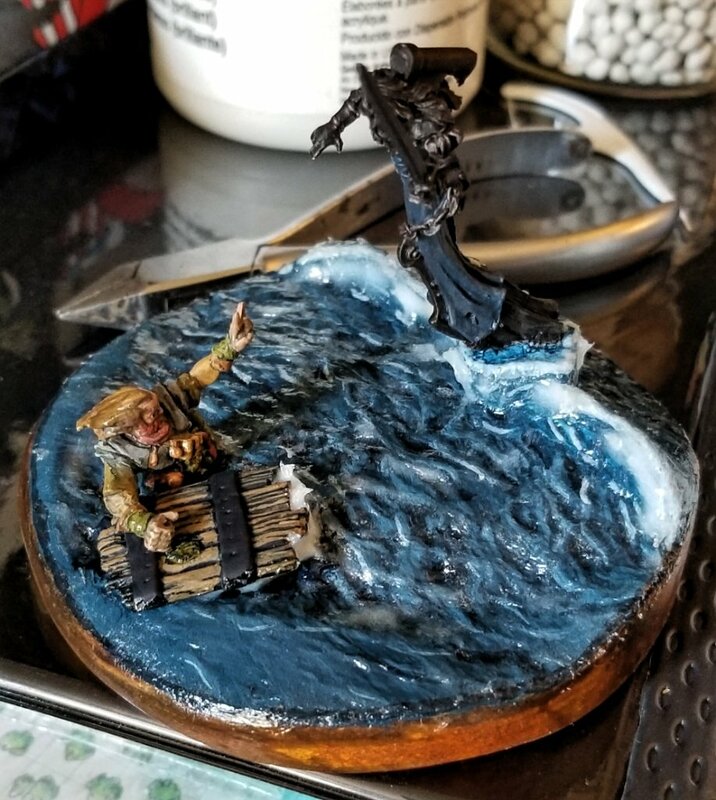 Well, it's been a while but I pulled the Dark Maiden and her subject of interest out and started working on them again. Specifically, I have added a flotation device and started the water layers. Liquitex Gloss Medium & Varnish to add a nice base shine. Golden Heavy Gel to add some volume and sculpt so effect to the wave. Golden Heavy Gel again to build up the layers and glue down the "door". I added some under the wood for what was lifted out of the water by Ezren leaning heavily on it to lift his arm free. The door was something I made a while ago had never really used. I trimmed the rounded edges to make a "broken" edges look to the top and bottom and painted it. 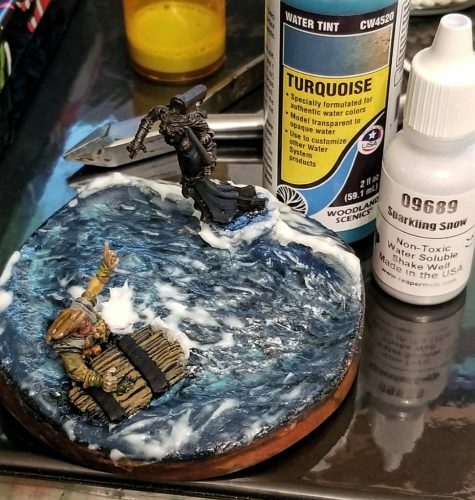 For those interested in how to build and to paint (airbrush) a water display base ... 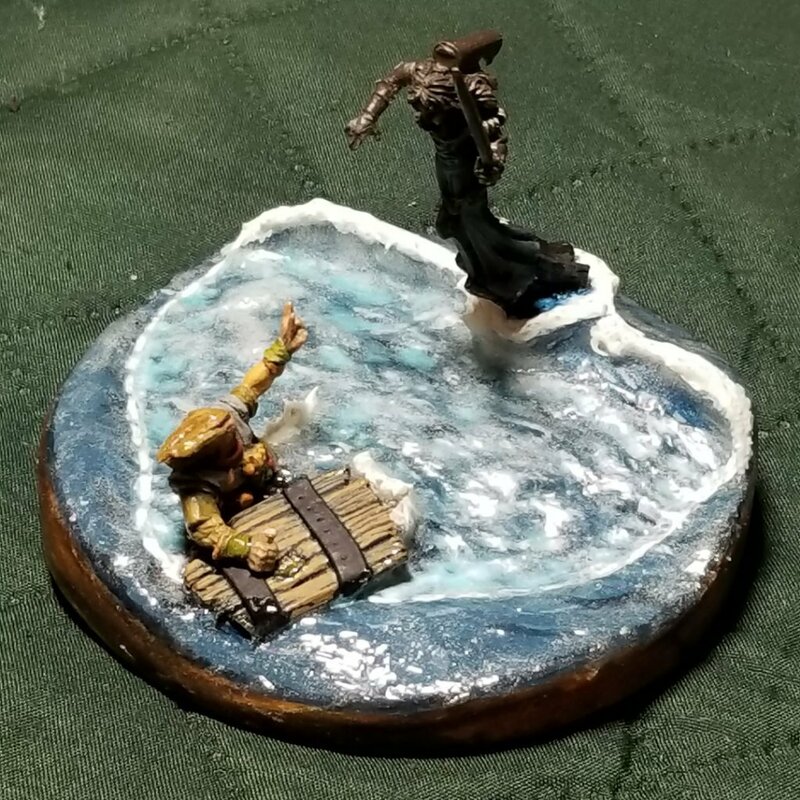 I recently enjoyed this tutorial by James Powell posted to the Weathered Models group on Facebook. I utilize some of the ideas and techniques he discusses above as I am building up the layers. I will be specifically be using the polyfill to add some more interesting details to the waves and splashes. Next, I started off with another Liquitex Gloss Medium & Varnish layer. At that point, I decided on my underwater effect. I mixed what you see in the photo, Woodland Scenics Turquoise Water Tint and Reaper Sparkling Snow with the Gloss Medium and Water. That went into the heart-shaped area between Ezren and the Maiden, like a shield or fringe of a spell on the water. I then added more Golden Heavy Gel to the back to help build the wave as well as to the front edges. Ezren has just lifted his arm from the water so I created an effect below his arm showing the movement. Okay, I decided to create a concoction of the Golden Heavy Gel and the Liquitex Gloss Medium & Varnish that I've dubbed, "Gloss Goo™." So I mixed equal parts of water and the Gloss Medium along with a generous dollop of the Gel in a separate container. I threw in some glass beads for agitators and shook it all up to mix the gel into the varnish. The whole thing is a creamy yogurt consistency. 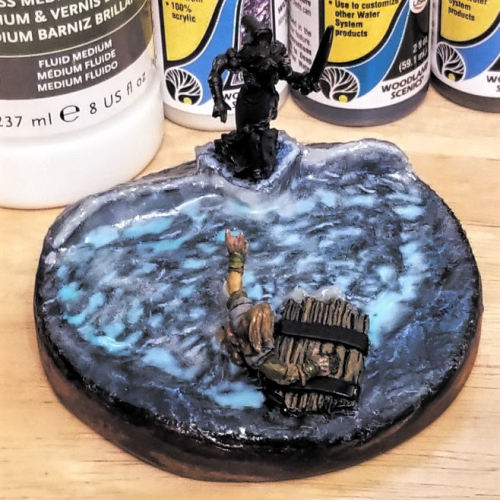 Using the same large 6mm flat brush I've been using to apply the layers all along, I dabbed the Gloss Goo™ onto the water surface. It was drying a lot faster than Gel would alone. By the next day, it was ready for the next coat. Happy Seppuku's recently released Coins and Basalt stamps. 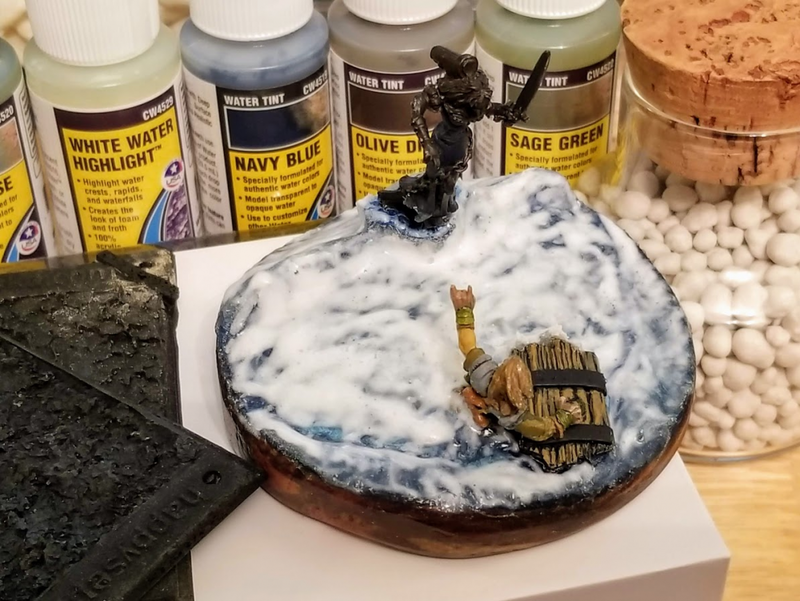 Woodland Scenics Water Tints (Turquoise, Navy Blue, Olive Drab, and Sage Green) plus White Water Highlight. All bought on clearance at Hobby Lobby at around a $1.00 a piece. In the corked jar to the right are Plastic Rocks for use with plaster, glue or paint when creating scenes for model railroads. I got two bottles for like 50 cents as another Hobby Lobby clearance nab. I added a straight Gloss Medium & Varnish layer and then another layer of the Turquoise spell effect. Which dried fairly well in the air conditioning. Once that's dried I decided to do some highlighting of the spell effect before going back to the goo. I also start the white water of the cresting waves. 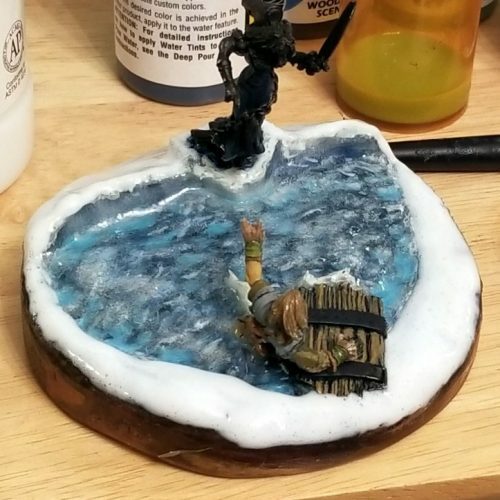 I added Reaper Sparkling Snow as a wash with a little gloss medium mixed in to create the silvery effect. Finally, I added another Gloss Goo™ layer. Kind of looks like I glazed a cookie. It should dry relatively quickly in the A.C. overnight.